I’m going to be totally raw here. I don’t struggle often with negative feelings as I live a blessed life and one I’m very grateful for, but right now I feel quite broken. I’ve had months of loss, struggle, and change and I’m grappling with the emotions that go along with that. Brokenness is not a new feeling to any of us. After all, how do we get through life without hurt, disappointment, and disillusionment? If we are alive, we at least have pain in common. While I’m not unfamiliar with brokenness, it never feels good despite what can come from it. I’m grateful that God somehow, miraculously was able many years ago to take the heap of wrongs against me and by me and weave them into a tapestry of grace that together doesn’t look quite so flawed as I feel. I’m grateful that He took the pieces of my shattered soul and created a beautiful mosaic life I didn’t have the courage to believe for–a life that the pieces singly amount to a bunch of useless shards, but submitted to the One who created me and knows what He designed me for, are becoming a work of art meant to reflect His glory and His handiwork. And I’m grateful that He isn’t finished with me yet. But, isn’t that what brokenness is all about? Isn’t it about creating something better, stronger, or more useful? 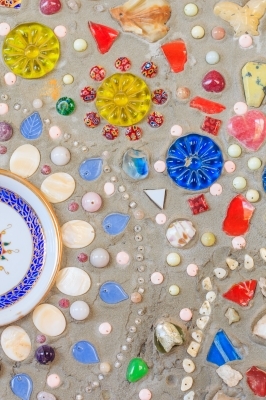 What if God just wants us to give all our ugly pieces to him–all our pain, all our disappointment, all our hurt and fear–and let Him reshape them into something beautiful? 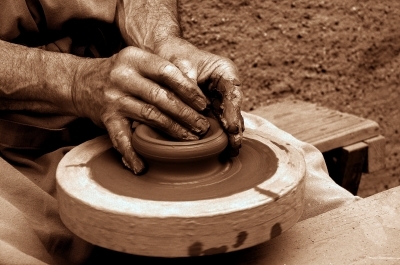 Isaiah 64:8 says, “We are the clay, and You our potter.” What if our brokenness is just the pressure from the Potter’s hand filing in the cracks or chipping away at out imperfections? Or perhaps we are broken by our own doing. Either way, we are never so broken that He can not repair us. What if we chose to trust Him at His word that He is our safe place and that all He allows, even the hardest things, are for our good? What if? My kids found a little box turtle yesterday and we brought it inside, set up a makeshift terrarium, and watched it for a while before releasing it back outside (yes, we homeschool). As I watched it tuck itself completely inside its shell, I felt a little like that turtle withdrawing in an effort to self-protect. But we are not turtles and we are not meant to build walls of protection like a shell. To do so would certainly keep us from pain, but it would also keep us from joy. We are created to love and be loved and sometimes that just hurts. But it is only through the wounds that we have a story to tell that is uniquely our own. Much like the scars on our bodies that tell of falls from a bike or other long-ago adventures, scars on our hearts also tell a story–a story of real love and real life. I would like to encourage you to trust God with your brokenness. Submitted to Him, He will create you and re-create you with excellence “that the excellence of the power may be of God and not of us. We are hard-pressed on every side, yet not crushed; we are perplexed, but not in despair; persecuted, but not forsaken; struck down, but not destroyed” (2 Cor 4:7-9). I don’t like where I am right now. It’s hard, but I know God will not leave me here. If I choose to submit to the process instead of resisting it, He will do something I can’t even envision just as He always has. And I remember that it’s when I’m broken that He is holding me most carefully.